Radiation therapy is a clinical modality dealing with the use of ionizing radiation to treat patients with malignant neoplasm's and occasionally benign tumors. Cell death is due to DNA damage. Radiotherapy aims at delivering precise dose of radiation to a defined target volume with the least possible damage to the surrounding normal tissues, resulting in eradication of tumor, good quality of life and improved survival. Accurate and reproducible treatment has always been an important aspect of high quality radiotherapy. Hence a mould room, with a trained technician to make appropriate custom made immobilization devices, is an integral part of Radiation oncology unit. An immobilization device helps to establish and maintain the patient in a fixed well-defined position for every treatment session as well as during a single treatment session. The backbone of modern high precision radiotherapy is intensity modulation across all three dimensions. IMRT is a new paradigm shift in Radiation therapy which uses software based planning and delivery of tightly focused radiation beams to tumors with significantly reducing the radiation dose to surrounding healthy tissues and organs and there by reducing side effects. Image Guided Radiotherapy - a step ahead of IMRT – delivers radiation with enhanced precision and accuracy towards precision. A CT scan of the patient is taken in treatment position everyday before delivering radiation using cone beam CT scanner attached to the linear accelerator which ensures the radiation is being delivered to the intended region in millimeter accuracy. SBRT is a new procedure for treating small tumors of lung and liver cancer that uses high doses of radiation delivered to a precise target. By using special positioning and implanted markers in the body. 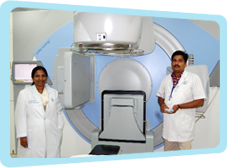 We are the first Centre in Coimbatore to start Linear Accelerator. Apart from conventional radiotherapy we offer appropriate technology for given case including high precision stereotactic procedures and the latest VMAT technology. 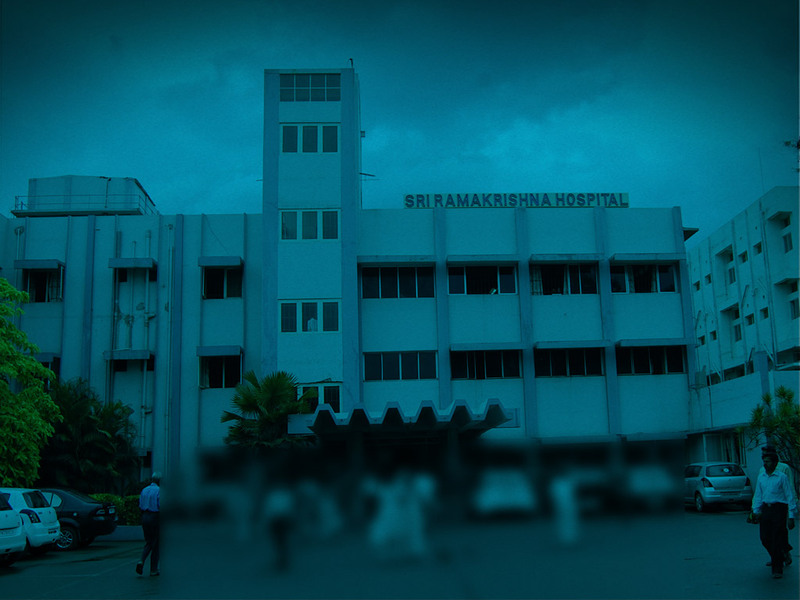 This machine is a boon to the field of radiation oncology. Linac generates multiple energies of X-Rays from 4MV to 25MV. X-ray mode is used to treat deep seated tumours. Electron mode is available for treating superficial tumours. Electron beams in the range of 6 to 20 Mev are available. The energy level is chosen according to the depth of the tumour. Multileaf collimator (MLC) is a very important accessory in the Linac for planning 3D Conformal Radio Therapy (CRT)f. It has the ability to set the field to various shapes according to the target volume and produce arbitrary intensity distributions remotely and automatically. Computer controlled MLC is ideally suited for delivering complex treatment safely, in times comparable with or even shorter than the manual delivery of conventional treatment. This is a recent technique where the field shape conforms three dimensionally to the tumor. Multiple 2 0r 3mm CT sections are taken. Images are transferred to the 3D treatment planning system. The planning target volume (PTV) is marked in every CT section. The critical structures in each section are outlined. Multileaf collimation is done to get a field conforming to the target volume sparing the normal tissues. Dose prescription and computation is done. Plan evaluation by a Dose Volume Histogram (DVH) is mandatory. Optimization is a systematic computerized process that generates a large number of plans rapidly, to finalize the optimal plan. Quality assurance is the crucial step in all modern radiotherapy modalities. The dose deliver is confirmed with acrylic phantoms to be doubly sure that the treatment is accurate. Brachy therapy is a technique where the radioactive sources are placed into or close to the tumour resulting in a high dose delivered to the tumour than the surrounding tissue. High dose rate brachytherapy is radio biologically proven to be as effective as low dose rate. As these machines are remote after-loading type, exposure to the radiation personnel is minimum. As this system is computer controlled, precise planning and optimization is possible. It is used in treatment of cancers of oral cavity, esophagus, breast and cervix commonly. Nuclear medicine is a medical speciality, and cost that uses safe, painless and cost –effective techniques to image the body and treat disease. Nuclear image is unique in that it documents both organ function and morphology. When we already have X- ray, Ultrasound, CT & MRI, Why do we need this ? It improves unique functional information from cellular and molecular levels which is not possible with other modalities. It enables objective and prognostic assessment of the disease. Radio nuclide procedures are available for almost all organ systems just like the different X-ray procedures. It is used in evaluation of Heart, Lung, Brain, Bone, Kidneys, Liver etc. Scans are designed to study various aspects like concentration , excretion, drainage, flow of tracers in various organs or localize/ characterize the pathology.